A US court said that the Argentine plan to get creditors to swap their defaulted bonds for new debt issued locally is illegal. According to New York Judge Thomas Griesa, the plan is “lawless”. However, most of the world’s media took note that he did not go as far as finding Argentina in contempt. Argentina was facing an impasse when a previous court ruling banned it from paying interest to creditors who had agreed on a deal. Judge Griesa had ruled in July that the holdouts – creditors that did not agree on any deal because they wanted full payment – must be paid first. Earlier this month, over 100 distinguished economists called on the US Congress in a letter to take action to mitigate the potentially damaging consequences of Judge Griesa’s ruling. The US judge said he was “horrified” that the Argentine government had not consulted with their legal team in New York before announcing their plan to move payments. The holdouts, which bought Argentine bonds at a massive discount after its economy collapsed, are owed approximately $1.3 billion. If they had agreed to the deal most other investors are happy with, they would still have made a huge profit. The Argentine government calls the holdouts “vultures”, and says it cannot afford to pay them. If it did it would have to pay everybody the full amount, something it is unable to do. 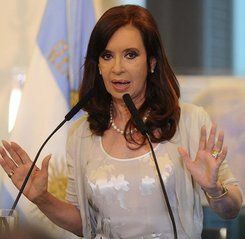 Argentina’s President Cristina Fernández de Kirchner says the ‘holdouts’ are like vultures. He is urging the Argentine authorities and the holdouts to push harder to find a compromise. “If we can have a process leading to settlement, that is the path that should be taken,” he said. Or akin to a ‘pound of flesh’ demand? Some may say the situation is more similar to a debtor who owes 20 creditors $100,000. Eighteen of them have accepted $80,000 in a settlement because the debtor is broke. However, two creditors who are owed $10,000 (and bought the debt from other creditors at a fraction of that price) want the full amount. An arbitrator decides that the 18 creditors who are happy with the $80,000 have no deal until the other two are in agreement. Nobody can be paid a penny until the two “holdouts” are happy. Just before the US Court’s announcement yesterday, Argentina’s Cabinet Chief Jorge Capitanich said a sovereign country cannot end up in contempt, despite Mr. Griesa’s warnings. He hit out at “big concentrated transnational groups” who he accuses of imposing conditions that push his country back into a vicious circle of debt and never-ending extortion. One of the holdouts, hedge fund Aurelius Capital Management, criticized Argentina’s plan to move the jurisdiction of restructured debt to Buenos Aires. This video explains that the Argentine plan to restructure its external debt by bypassing a US court ruling raises the risk of investors demanding accelerated payment of their bond holdings.